Do You Have a Structured Settlement or Annuity? If you are receiving ongoing payments over a period of time, you may have a Structured Settlement or an Annuity. Structured Settlements are paid by insurance companies to resolve a lawsuit or claim. At the time of settlement, you may not have had an option to receive a lump sum of money. Since these payments are inflexible, it could take up to a lifetime to receive all of the money due from the settlement. Is your payment stream sufficient to make an important purchase for you or your family today? If your needs or financial situation have changed, you may benefit from a lump sum payout. In most states, you have the legal option to sell your future settlement or annuity payments to a settlement funding company, like Singer Asset Finance Company. Singer can give you the option to legally access your own money when you need it the most. 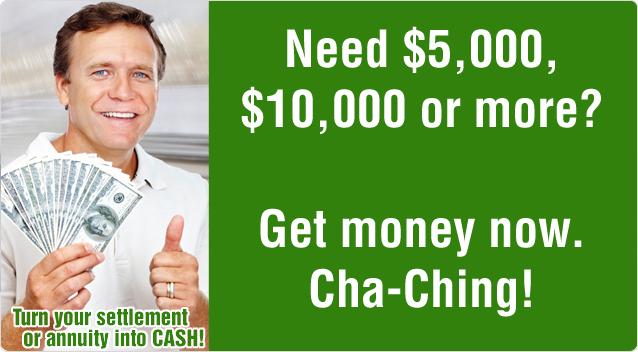 Some of our customers choose to get only the cash they need now by selling just a portion of their annuity payments. An online settlement cash quote can help you determine how many payments you want to sell. Call Singer today to find out if a lump sum payout option is right for you. Learn more about how to sell your structured settlement.